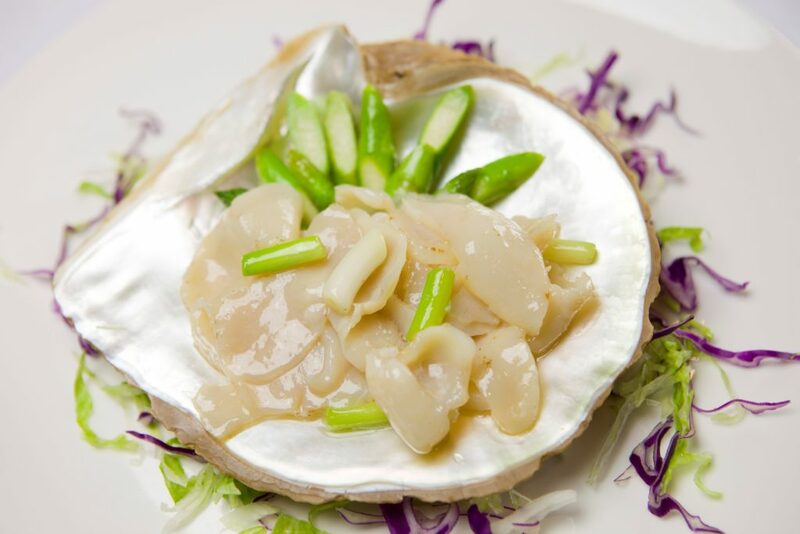 Pearl meat from Broome, Western Australia, thinly sliced and stir-fried with spring onions and garlic chives. Served with oyster sauce. Slice pearl meat very finely. Note – the thinner the pearl meat, the quicker it will cook. Remove the root ends and the dark green ends from the spring onions. Discard. Remove the outer layer of the spring onion, leaving only the core then slice into fine 3cm long lengths. Wash and cut the asparagus into 3cm lengths. In a small bowl, combine the chicken stock, shao hsing wine, potato flour and the salt. Reserve. (Note – it will require re-mixing just prior to pouring into the wok). Bring a small pot or wok of water to boil then blanch asparagus for approximately 30 seconds. Drain. Heat a wok with ½ tsp of oil then stir-fry the asparagus, with a pinch of salt, for 20 seconds. Remove from wok. Reserve for plating. While the wok is still hot, add sufficient oil to just submerge the pearl meat. When the oil reaches approx 80°C, flash-fry the pearl meat for less than 10 seconds. Do not overcook. Loosen the pieces of pearl meat, remove from oil and drain on absorbent paper. Discard the remaining the oil from the wok. Keeping the wok hot, use only the oil remaining in the wok to stir-fry the spring onion pieces followed by the pearl meat. Toss for 10 seconds, then add the chicken stock mixture. Continuously move the ingredients in the wok to allow the potato flour to thicken evenly. Add the garlic chives. Stir, then immediately finish by adding the sesame oil to the pearl meat while still in the wok. Plate the asparagus and the pearl meat, accompanied by oyster sauce for dipping as a condiment.